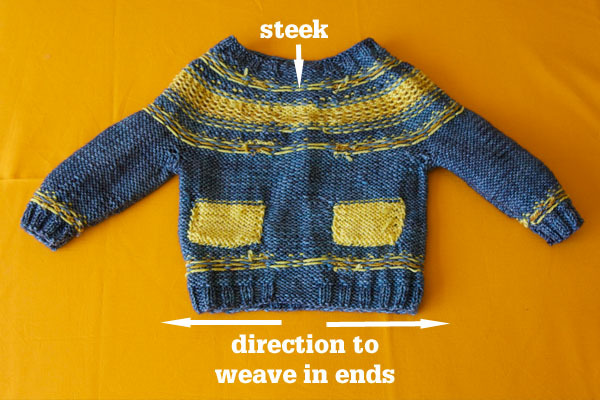 What you will need to steek: a sweater, some yarn (you can use the same colour yarn as the sweater MC or a contrasting one, I found it didn’t matter so I used a contrasting colour to make this tutorial clear), a crochet hook a few sizes smaller than the needle size for the sweater, a darning needle, and scissors. 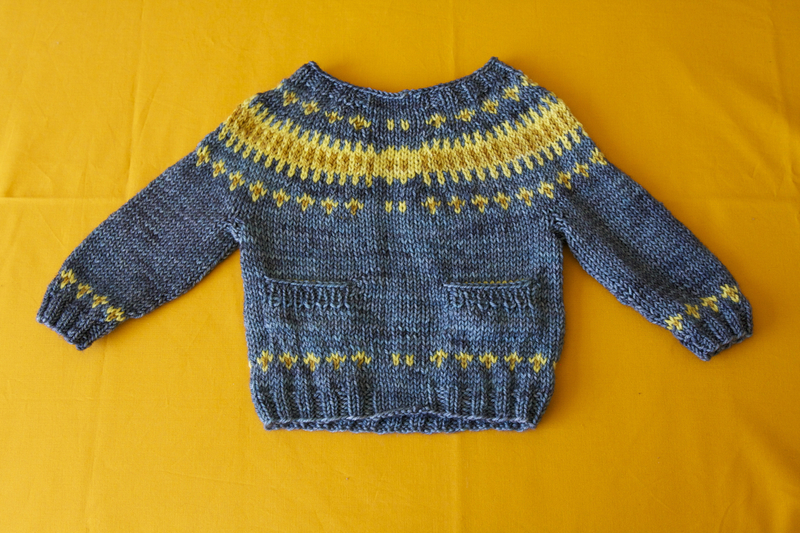 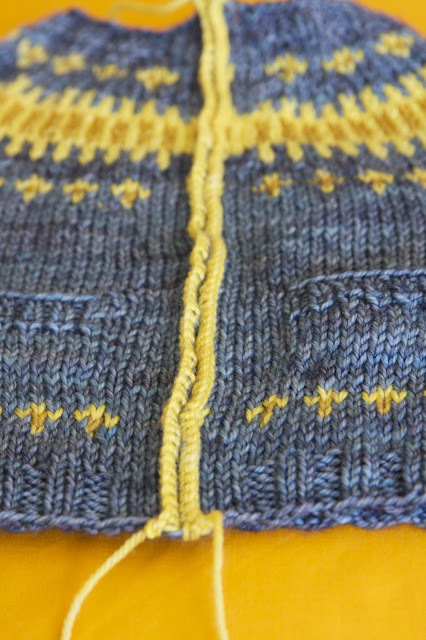 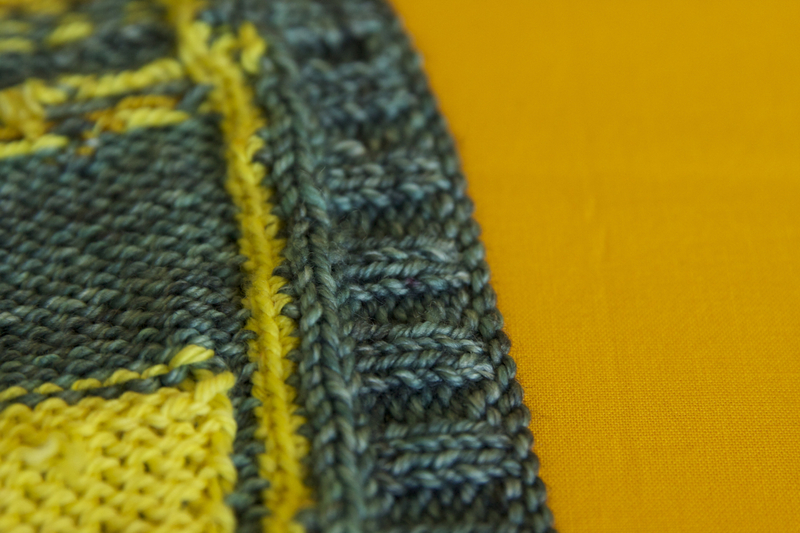 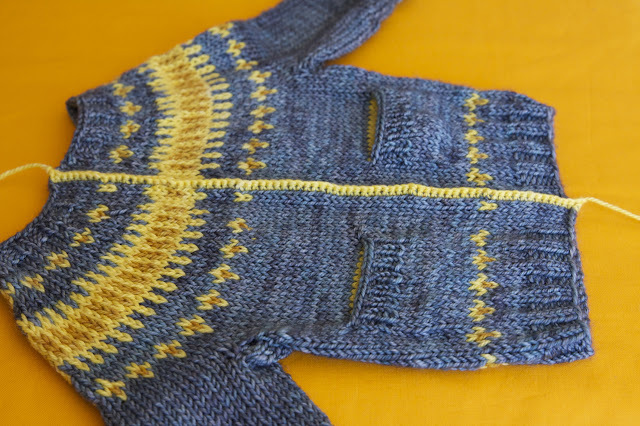 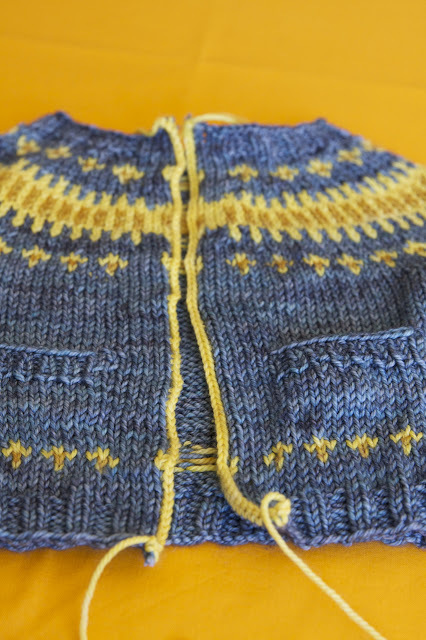 The Clayoquot pattern has 5 steek stitches (numbered below). 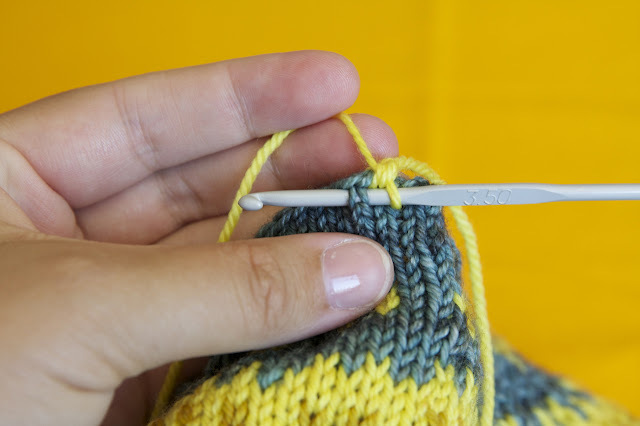 The right crochet reinforcement will use half of stitch 3 and half of stitch 4, and the left crochet reinforcement will use the other half of stitch 3 and half of stitch 2. 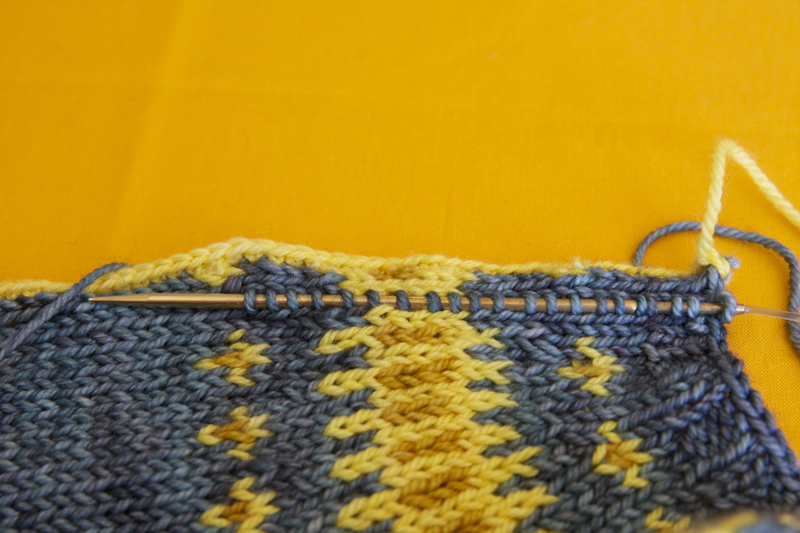 The cut comes right down the middle of stitch 3. First you will need to secure your yarn to start your reinforcement. 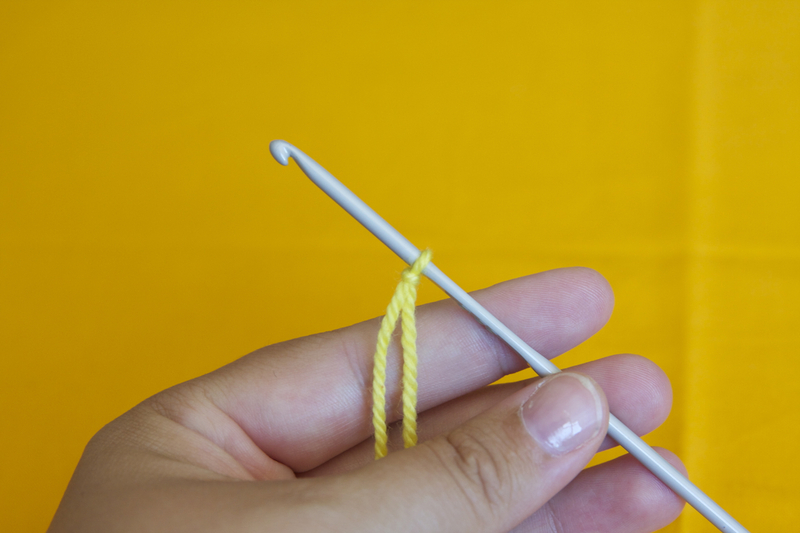 1. make a slip knot over your crochet hook. 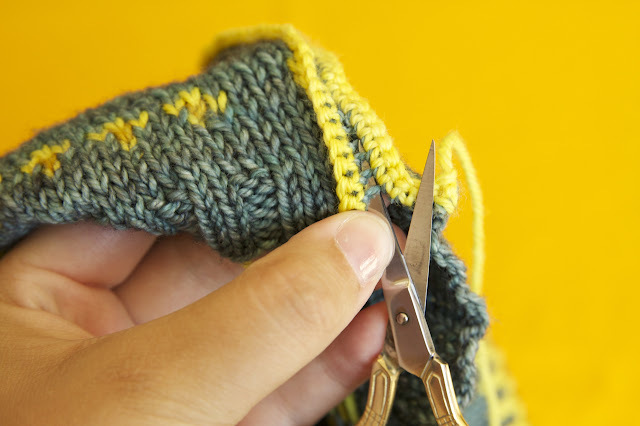 You will continue working steps 1-3 in each stitch until you have worked all of the stitches. 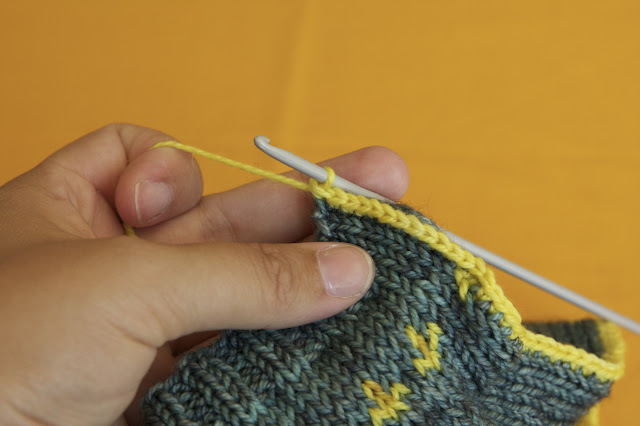 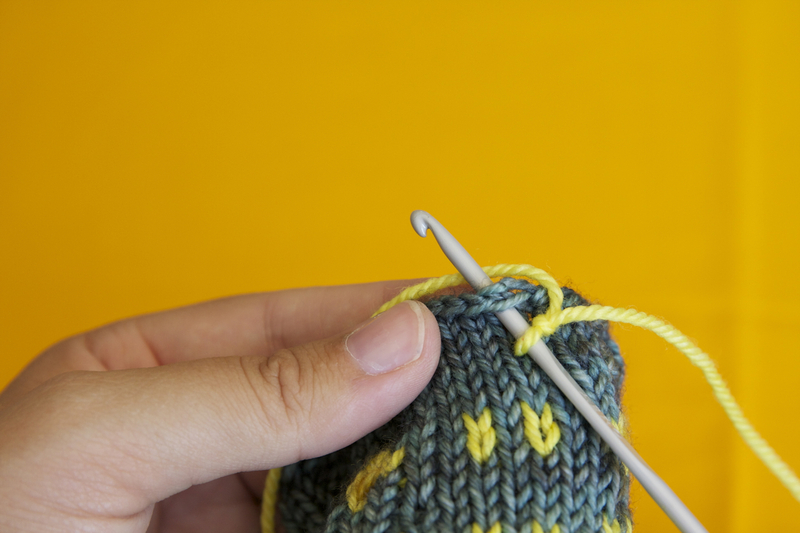 At the end, put your hook through the center of stitch 4. 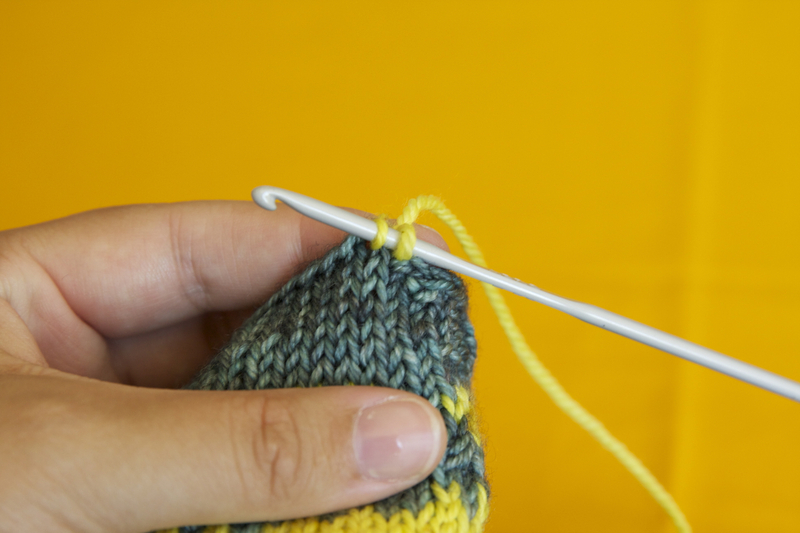 Pull up a loop, pull your working yarn through both loops on the hook. 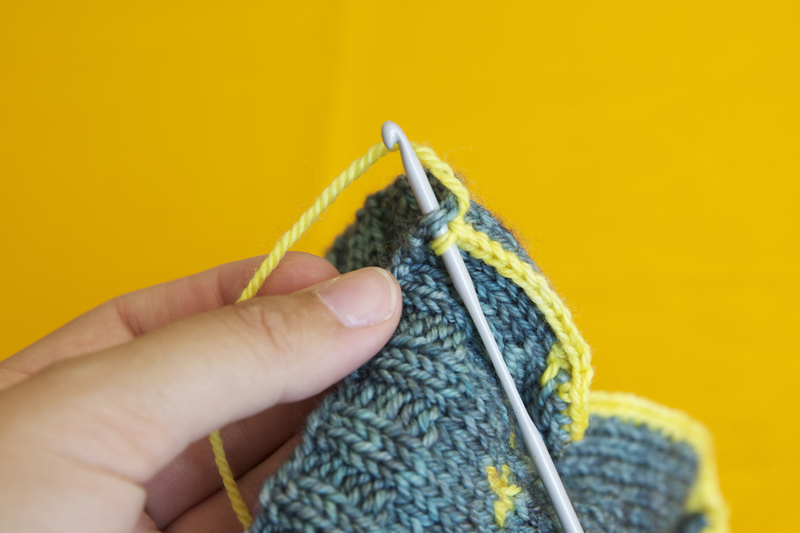 Cut your yarn, leaving a 6 inch tail, and pull the tail through the last live stitch, fastening off your work. Your first crochet reinforcement is complete! 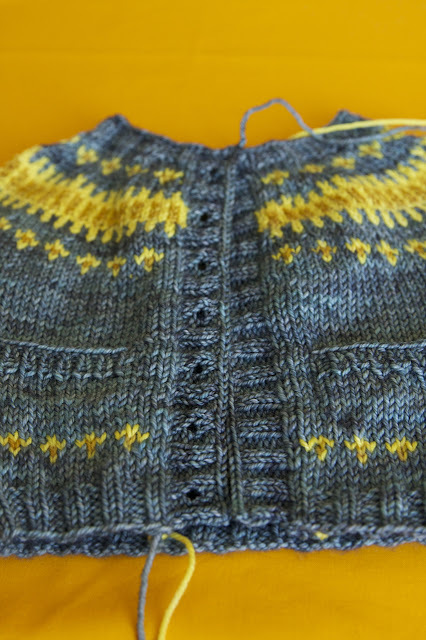 The second reinforcement is worked in the opposite direction, starting at the bottom of the sweater and working your way to the top. 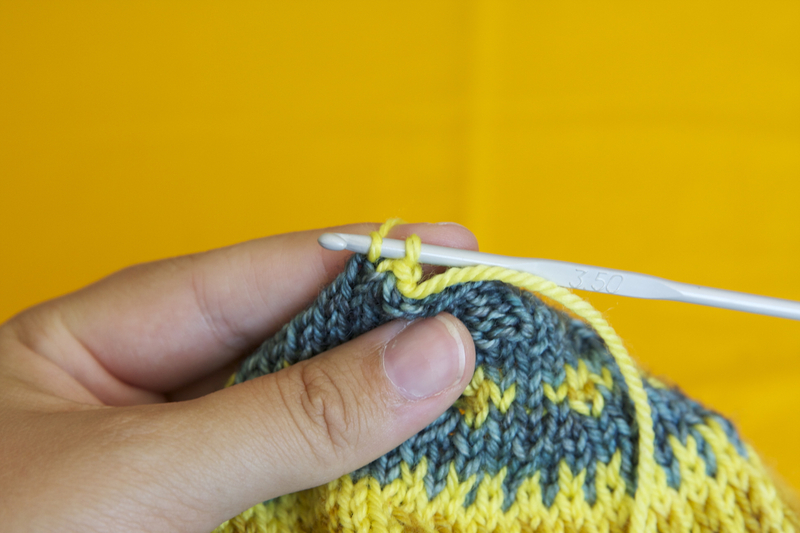 You will be working your single crochet chain through stitches 2 and 3. Both reinforcements are complete. 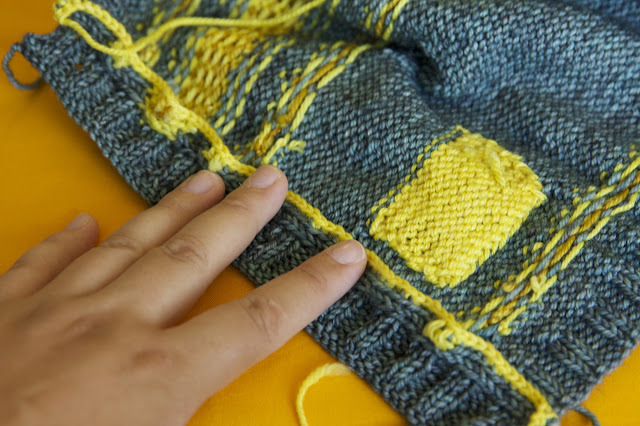 See how the crochet chains naturally lean away from where you are going to cut? Take a deep breath, some sharp scissors, and here goes nothin’! Picking up the button band is the same as any sweater, just a little further in than usual. 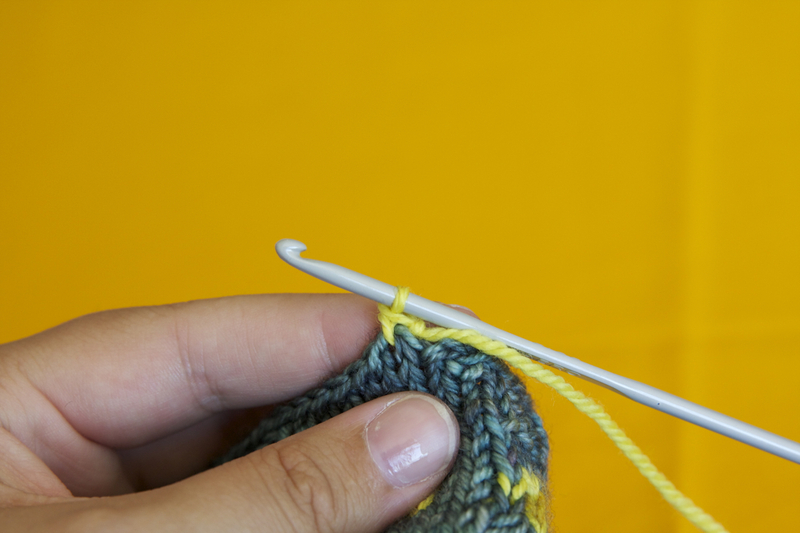 Insert your needle from the right side to the wrong side and draw up a loop. 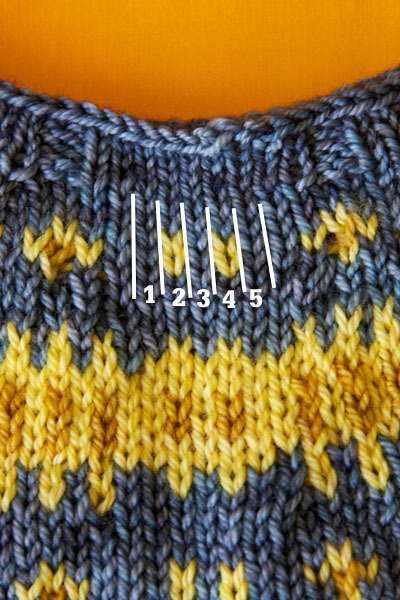 Continue picking up at the rate specified in your pattern. 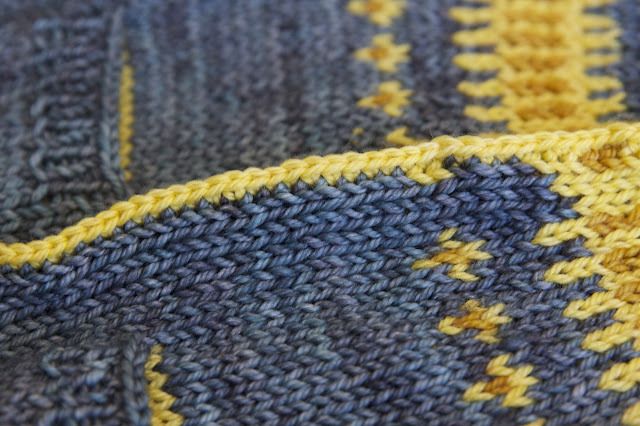 You may also want to check out the ‘steek sandwich’ that Kate Davies uses. Picking up stitches: The yarn is coming from the wrong side to the right side. 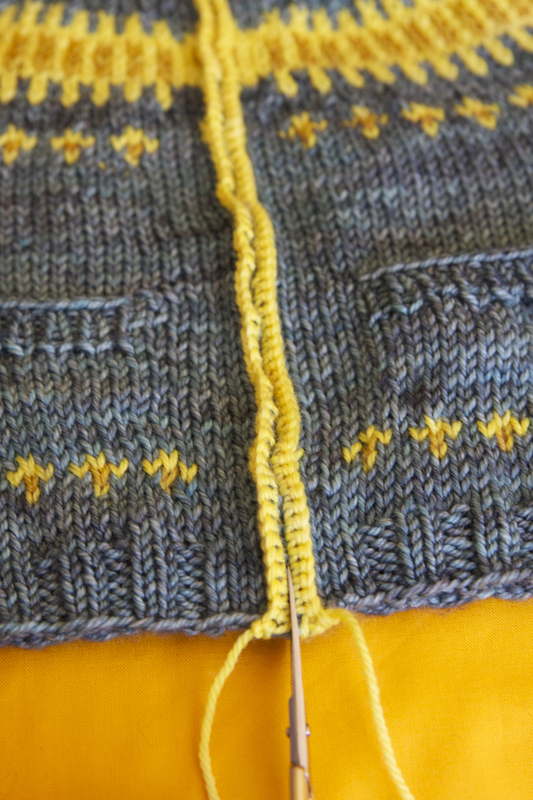 When I finished steeking my sweater and putting on a button band I found there was a little extra flap. In order to keep the ends from rubbing I sewed down the flap for a little extra security.